How to Install Shade Sails, The DIY Way! Shade sails are arguably the most popular shade product, certainly here at Global Shade anyway. One big reason behind this is that they are so easy to install that they are available premade for DIY installation. Along with custom shade sails, we also manufacture a range of shade sails for DIY enthusiasts, or anyone looking for an instant shade solution. Our DIY shade sails are available in a range of set shapes and sizes, and they can be easily installed in very little time. Today, I will offer you an easy guide to installing shade sails, DIY style. Follow this guide, and you’ll face no problems during installation. Before you start installing shade sails DIY style, there are certain factors you must consider. First of all, you’ll need to determine suitable fixing points for putting up your shade sail. You can find existing fixing points on trees, fence posts, fascia or pergolas. Make sure that all fixing points are structurally sound. You can purchase shade sail fixing accessories from your local hardware retailer. One very important point to note is that certain chemicals such chlorine can lead to premature breakdown of shade sail fabrics. 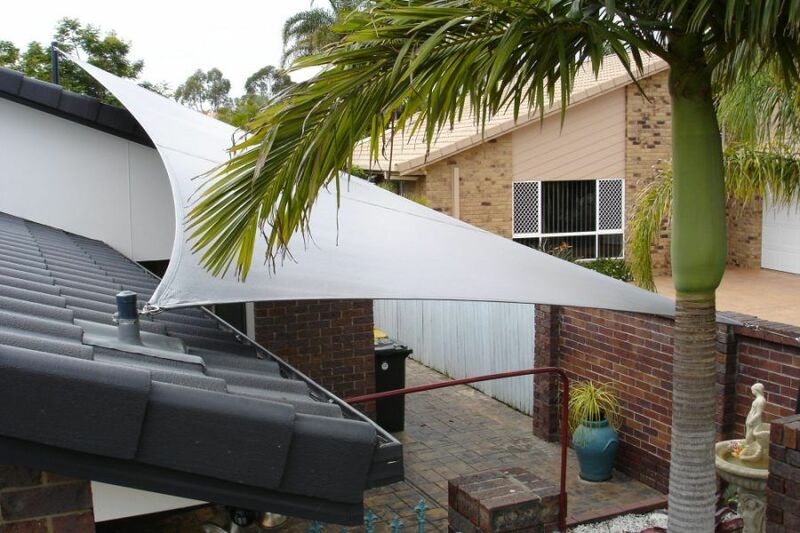 Ensure that you’re not installing your shade sail over barbeque areas or open flames. Also, make sure to check with local authorities if you need any permits or approvals to put up a shade sail. Now, here’s a step-by-step guide to installing shade sails DIY style. Take careful measurements and mark points for putting up the fixing accessories. When you’re done, drill holes and attach your anchor fittings. Make sure that your fittings are held in place with nuts and washers. After fixing your anchor fittings, you’ll need to tighten them further before you attach the shade sail. To do so, simply place a spanner and hold the nut in place, while using a screwdriver to tighten the fitting. Twist the fittings as tight as you can and do it for all fixing points. Attach the corners of your DIY shade sail with turnbuckles. To do this, simply attach turnbuckles to D-links and thread them through the holes provided at the corner of your shade sail. Screw the D-links with bolts to hold the turnbuckles securely in place. You’ll also need to attach D-links to your fixing points securely. Simply thread D-links and attach them to your fixing points with the help of bolts. Take the corners of your shade sail and hook up the turnbuckles to the D-links that you’ve attached to your fixing points. You should do this corner by corner, and you’ll soon have your shade sail up in place. After hooking things up, adjust the turnbuckles so that the tension is evenly spread out across the shade sail. Installing shade sails DIY style is very easy, and anybody can do it. Before you start with the installation, make sure that you determine suitable fixing points and check with local authorities if you need approvals or permits to put up a shade sail. Purchase shade sail accessories from your local retailer. To put up a shade sail, start with measuring and drilling holes for fixing points and attach and tighten your anchor fittings. Next, attach turnbuckles to the corners of your shade sails and attach D-links to your fixing points. Finally, hook up your shade sail, tighten it, and you’re done! And, for the best quality DIY shade sails, consider us at Global Shade. Contact us for a free quote on our DIY shade sails today!